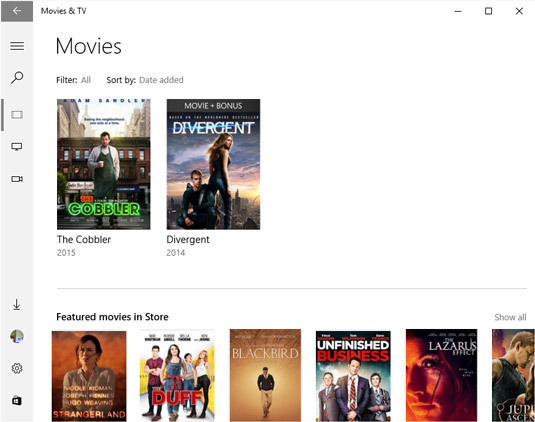 After you have bought a movie or TV show, from the Start menu, click the Movies & TV tile. Click the Movies button or the TV button in the Navigation pane to the left. In the window listing titles, click the title you want to play. In the resulting window, click the Play button (if you’ve already played part of this video, the Play button will read Resume) to begin the playback. If you’ve selected a TV series for which you own several episodes, select an episode before pressing the Play button. Movies and TV titles provide a download option. To save space on your hard drive or solid state drive, only download a title if you’ll be without a Wi-Fi connection for a time. Adjust the volume of any soundtrack by clicking the Volume button to open the volume slider and dragging the slider left (to make it softer) or right (to make it louder). Click the megaphone-shaped volume icon next to the slider to mute the sound (and click it again to turn the sound back on). Pause the playback by clicking the Pause button in the center of the toolbar. Enable captions by clicking the Show Closed Caption Menu button and then clicking the language you prefer. Change the proportions of the movie. Display the movie with a shadowbox effect by clicking the Aspect Ratio button. View the movie on full screen by clicking the Full Screen button. When the movie is displayed in full screen, the Full Screen button becomes an Exit Full Screen button. Click this button to view the movie in a smaller window. View the movie on a Bluetooth enabled TV by clicking the Cast to Device button. Click the Close button to close the Movie & TV app. You can also use the Movie & TV app to play video content. 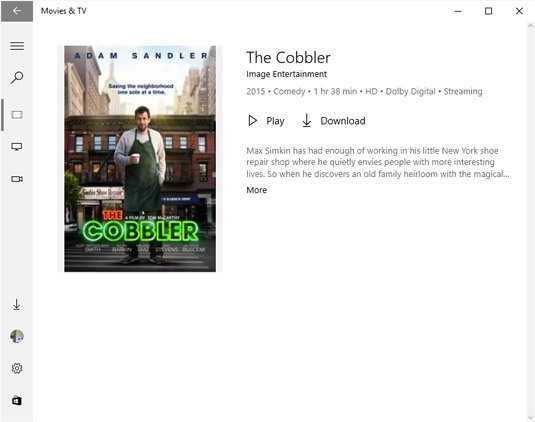 Just click the Movie & TV tile on the Start menu, locate the video in the Videos section, and click to play it. The playback controls are almost identical to those discussed for playing movies.